A recent audit of Albuquerque, N.M., SunTran's compressed natural gas buses questioned their reliability, safety and maintenance costs. It is another example of a growing skepticism about the operational practicality of CNG. The problems the audit mentioned, including leaking fuel tanks and failing to get accurate emissions readings from the buses, were primarily due to the buses operating at the city's mile-high altitude, said John Parker, development division manager of the City of Albuquerque Transit & Parking Department. The buses are equipped with the Cummins L10G engine, which was not designed to operate at peak levels at high altitudes. Most of the problems, some of which are common in transit buses, were fixed, Parker said. "The evidence for [the problems] was that some buses, in a snapshot of a series of work orders, were overdue for routine preventative maintenance when they were maintained. That was construed as meaning that they didn't get safety inspections," he said. "Well that's not true. 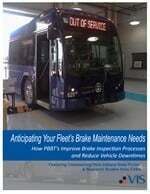 They get safety inspections twice a day—every bus does, at least twice a day." The audit was a routine check administered by the city. It used work orders from a small selection of buses from the Albuquerque CNG fleet to determine how the natural gas powered buses were performing. "We have cleaner air and we're trying to determine to what extent transit was responsible for that," Parker said. "We haven't gotten the final report, [and we] don't expect one until December, but obviously the things run cleaner than diesel." SunTran currently has on order 35 CNG vehicles, equipped with the 5.9-liter engine that SunTran uses in its trolleys. According to Parker, the 5.9-liter engine has a very good performance record and, after SunTran's experience with the engines used in the audited buses, the move to smaller buses with more reliable engines seems to work best.